We’re keeping in the electric theme. 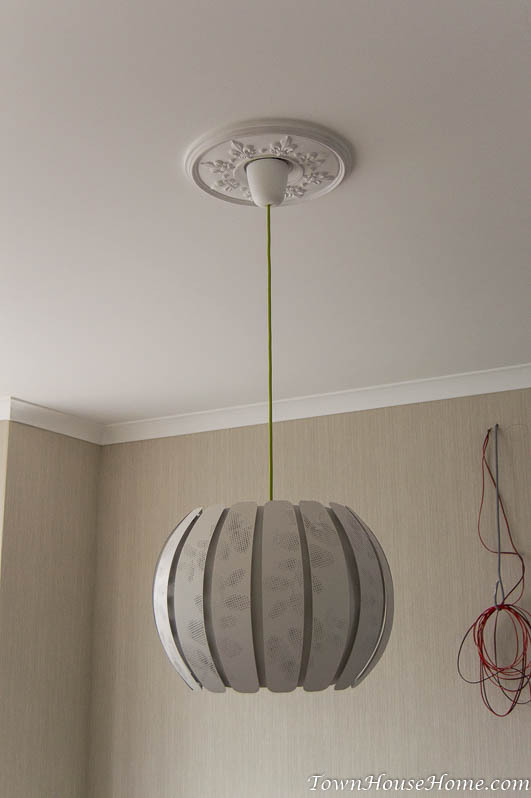 Pendant lights are going up, but before that, I still needed to add a finishing touch to the ceiling. … so I could then cut out the center piece with the jigsaw. They’re made of some kind of styrofoam, so cutting went easy. Then I glued the medallion in place with the same type of paste we used for the molding, finishing off the seam at the edge at the same time. Wash, rinse and repeat for the other two medallions in the room. 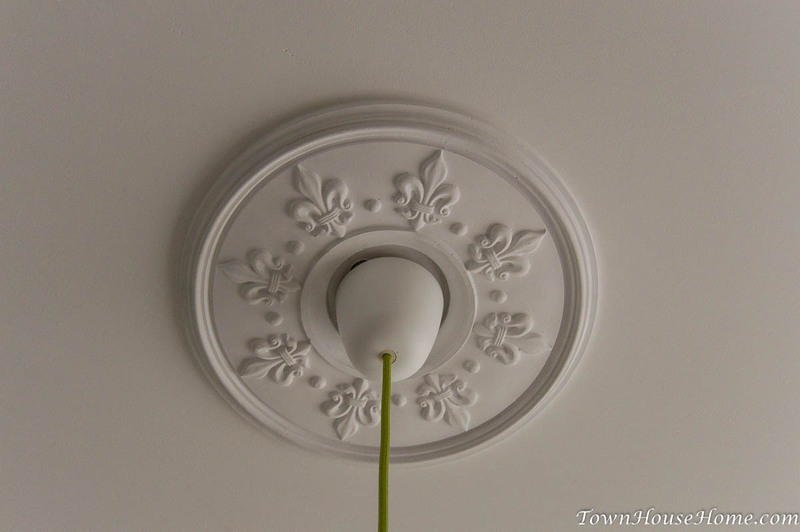 Once the paste had dried out, it was only a matter of painting it with the same paint as the ceiling before we could move on. Yeah, I do art-y stuff too! For the living room we had something special. Remember how I talked about my grandfather who once was a pro painter? Turns out they still had three medallions, tucked away on an attic at my parents’ place. Real gypsum ones. We could use any of them if we wanted, which we didn’t need to be told twice. The one we saw as a best fit for the living room already had a hole in the middle, so I didn’t need to cut it. I spray-painted it beforehand, as I wasn’t sure any brush strokes wouldn’t still be visible (and I have a spray-paint gun available anyway from the radiators), so I’d only have to do the seam once it was in place. First thing I did was installing three hooks. 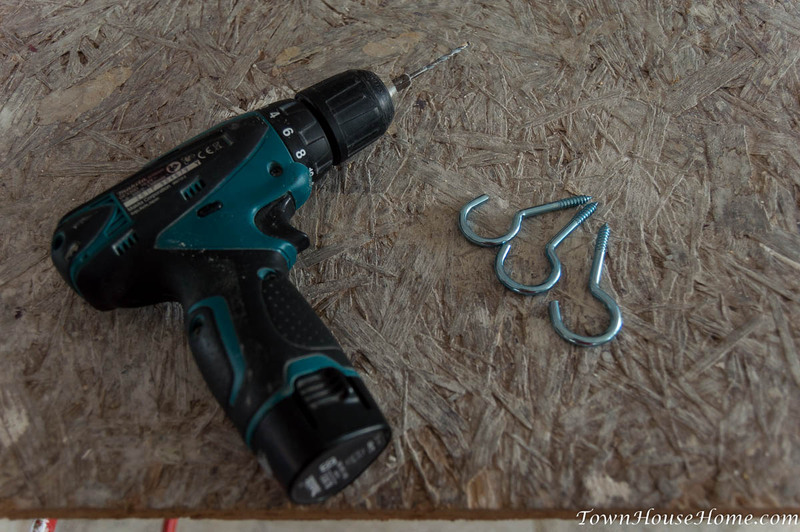 I had installed some OSB on the frame behind the drywall so I could hang these hooks safely. 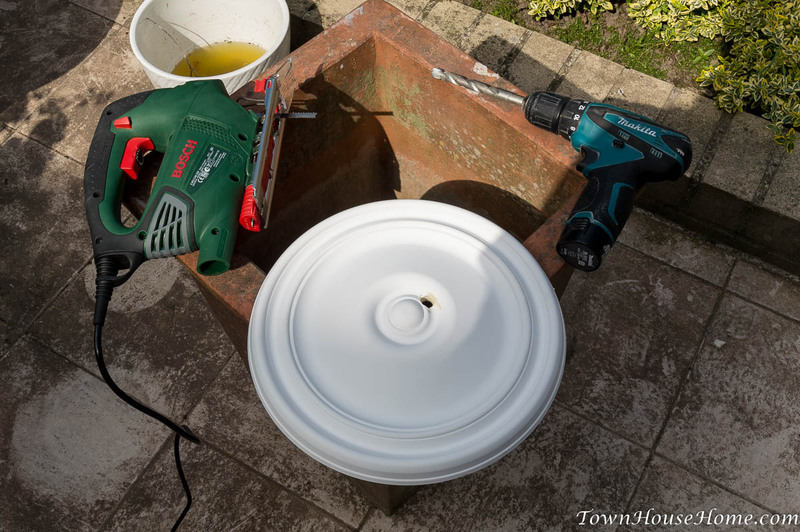 First I used a small drill in my trusty Makita, just a bit smaller than the core of the hook (without the screw thread): they were not of the self-drilling kind, so I needed a small pilot hole to get them in the OSB while still allowing them to grip firmly. 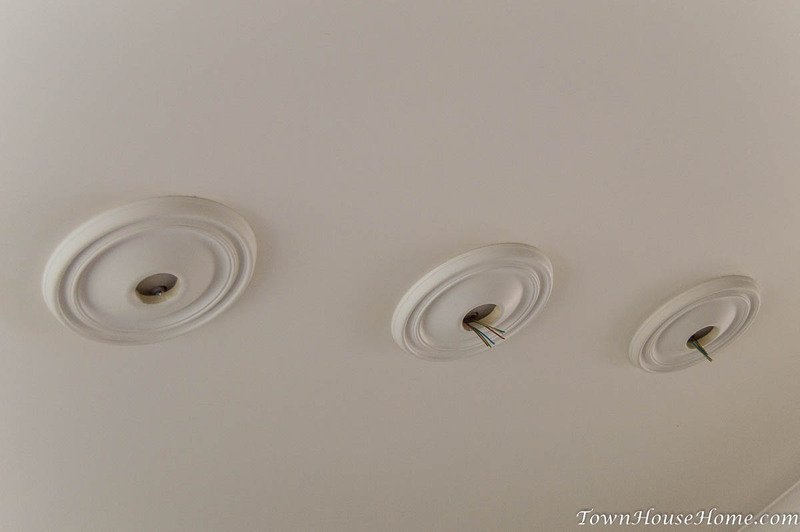 I tugged on them once they were screwed in all the way (I didn’t dare hang on them) and they didn’t seem to budge so hanging a pendant shouldn’t pose a problem. After that I had to turn my attention to the pendants. We had this idea of three identical pendants, more or less half an egg in shape (you know what I mean, don’t you?). It took us some time, but we finally agreed on something we find at a local hardware store (Brico Plan-It). 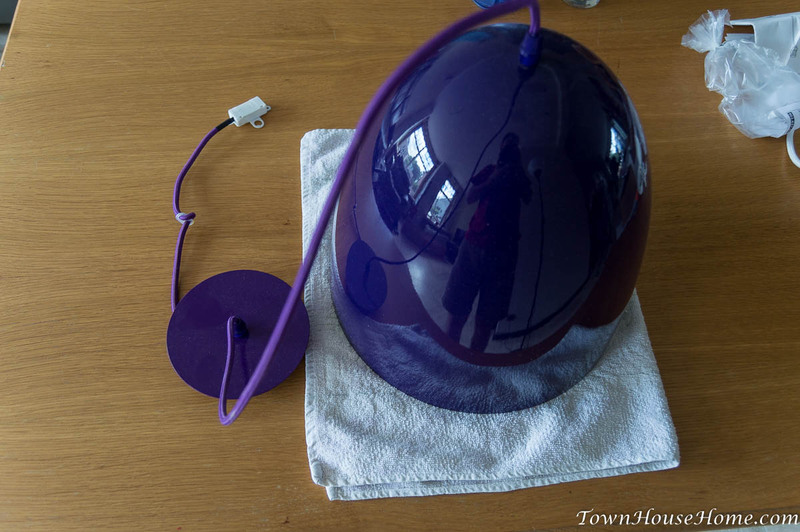 They had this nice, deep purple, half egg shaped pendant. 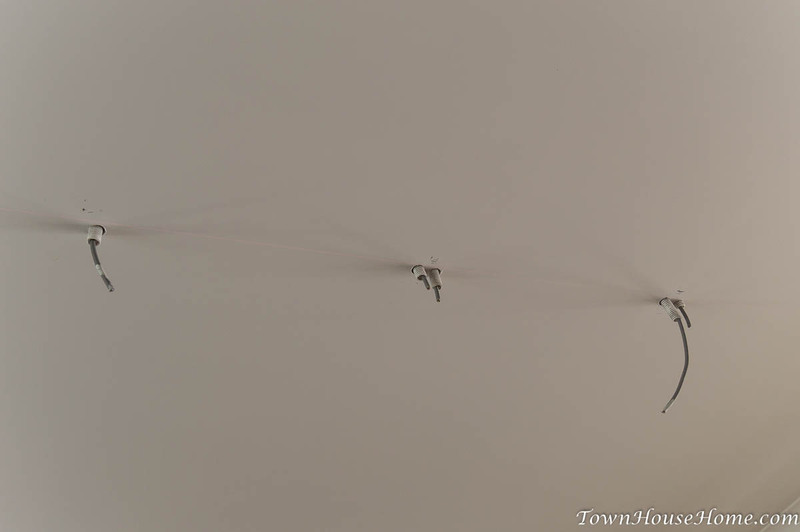 We ended up with three of those, but they still needed some tinkering with to be ready to go up against our ceiling. As you might notice in the photo above, they don’t have a nice cap that goes against a medallion and there’s no loop to go over the hook. 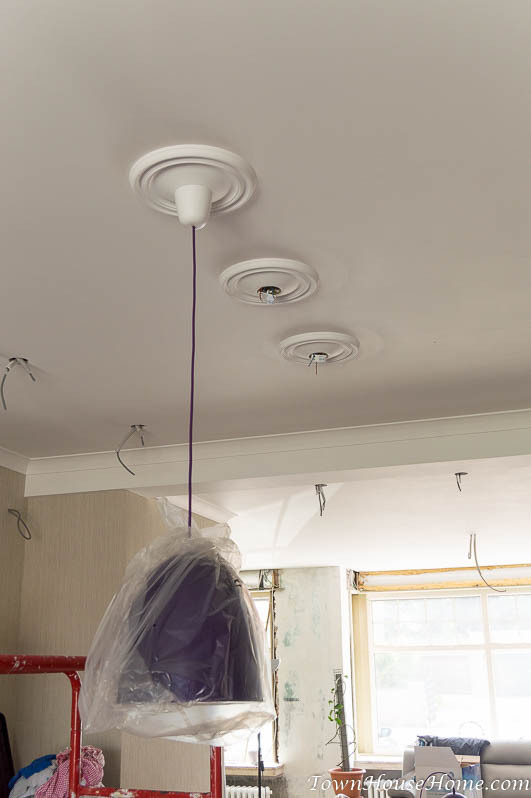 It’s a different installation system, where you install a metal part against the ceiling with screws, then that purple cap goes over that and holds up the wire of the pendant. 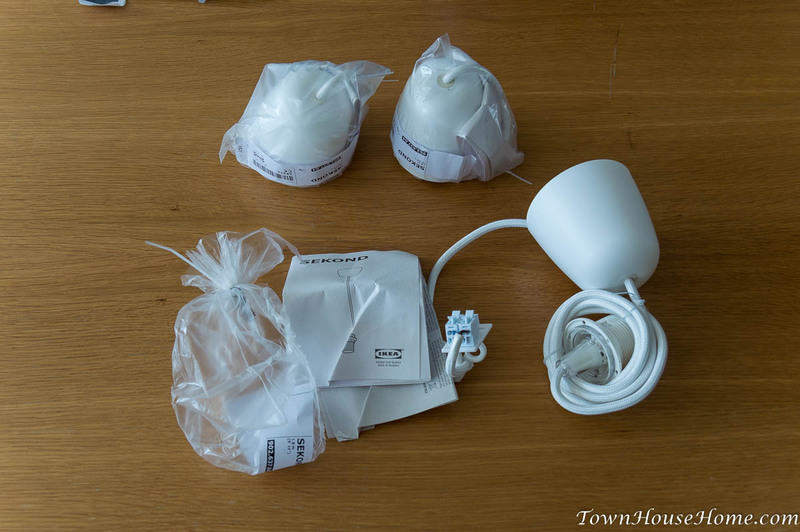 Go to Ikea and buy three white Sekond cord sets (which, in Belgium at least, has a cap and a connector instead of a plug). 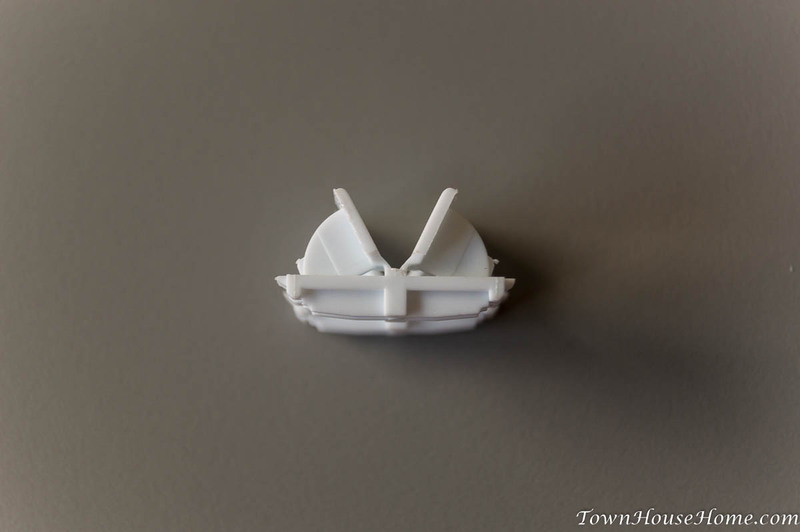 … so that you can take the part containing them off completely, by using a small screw driver. The metal parts should now come out easily. 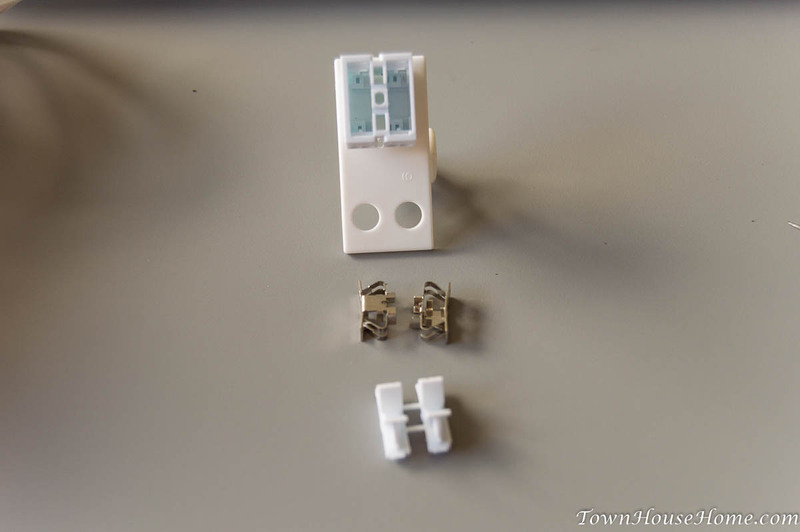 Now that you have your correct parts, just take off the corresponding parts on the pendant and make the actual swap. 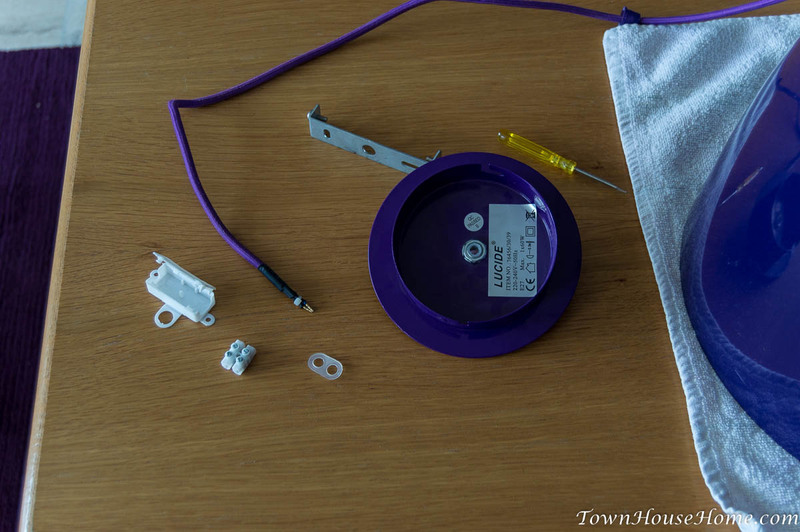 Turns out that the purple wire is slightly smaller than the white one, so the actual cup didn’t stay in place up top… I solved it by simply muffling a tiny piece of white cloth around the wire so it got caught by the rubber in the cap. Then I could finally hang them up! First I made sure the cord was to length. 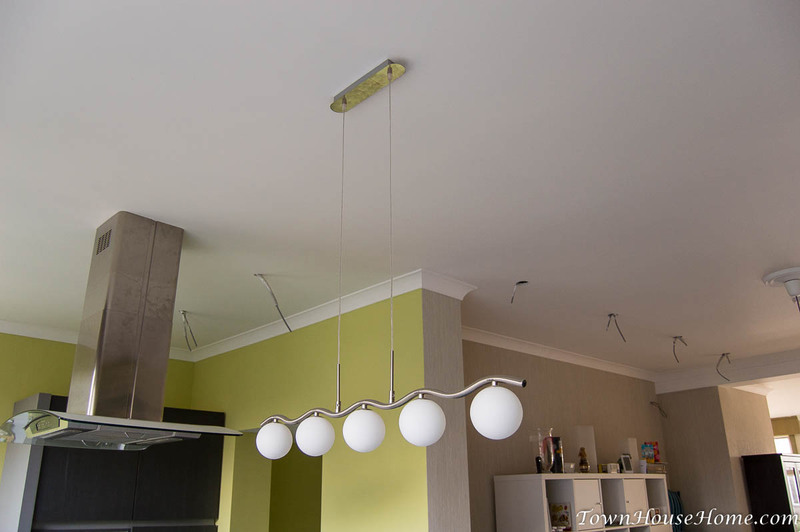 Right now the pendants here are hanging at 165 cm from the ground: this is high enough that (unless you’re exceptionally tall) you rarely bump into one and light up the table nicely while still giving a nice visual. 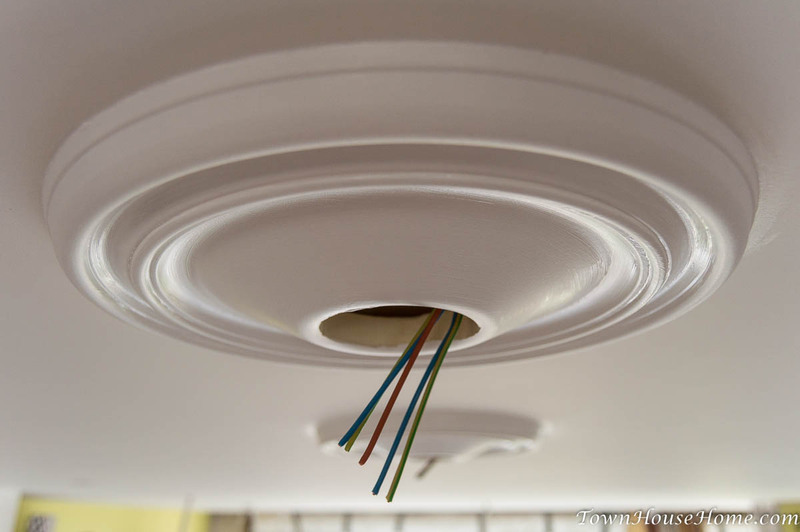 The final part was the electrical connection. My cabling arrives at the first pendant, goes from there to the second and then to the third. 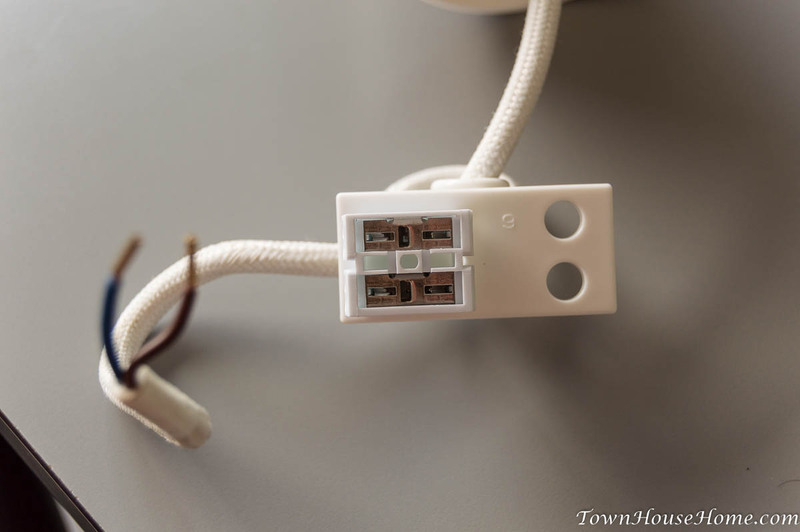 As the connector allows two wires each, this is easy: the arriving blue wire goes together with the departing blue wire in the connector to the blue wire for the pendant (and likewise for the brown wire). Since this pendant doesn’t have a connection for an earth wire, I simply wired them through using a 3-wire Wago clamp (except for the last one of course). This struggle took us longer. Eventually we settled on another Ikea find: the Överud. Believe it or not, but they also had a green Sekond set, which is practically a match to our wallpaper! 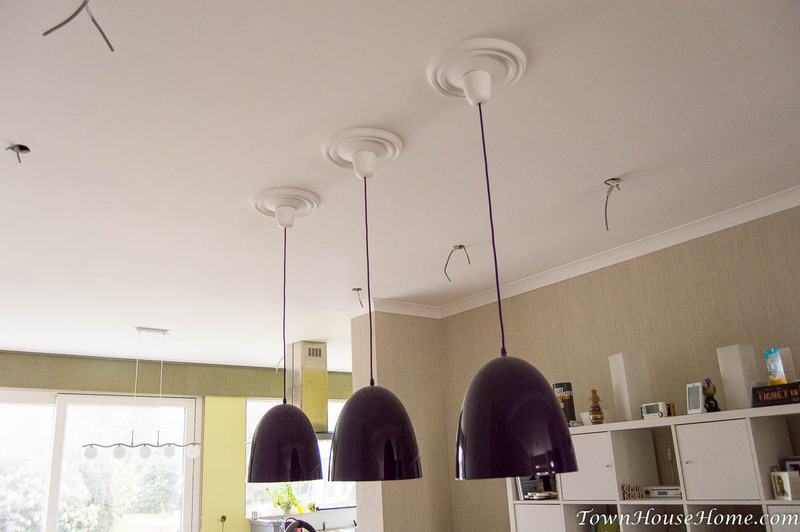 Installation itself was the same as the other pendants: hang it up, adjust the height and connect. Et voilà, let there be light! Next Window guy returns (part 1)!